Where do I start? I just thought he's more similar to Satoru Akashi but probably done right for some. Both are kind of a typical pirate- a love for adventure and a high risk taker to satisfy his curiosity. I just thought that his character was kind of cocky at first, although we do learn of his past was kind of tragic. What I thought of him and Akashi was that it was fun seeing how the flaw of being reckless and adventurous was put to the leader in itself where despite his shortcomings, he never forgot about his duty as the leader. 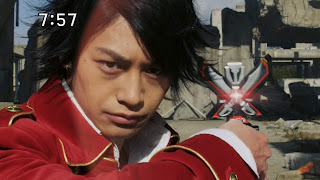 My favorite plot of his had to be with Basco which from the episode where Basco appeared to when they settled their rivalry, it was well-written despite flaws. Well he's one mysterious, kinda obviously not human to us every time we saw a close up of his face. Or maybe not. 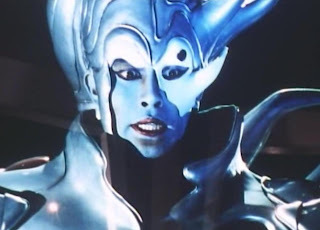 But I just thought that he's one of the scariest villains ever. Hearing his natural voice in Japanese, wow he's that scary! 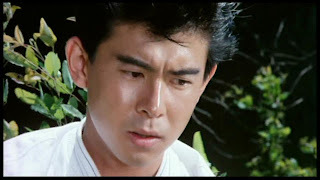 I really thought that his character development in Maskman has gone from dark to darker to darkest, especially when his true identity as the new Lethal Dobler the most powerful underground monster ever was revealed. Okay so why he ate his own parent the mother Lethal Dobler was DISGUSTING! I really just thought that he was one major SOB manipulating everyone underground and above just for his selfish reasons. In this episode we see that Gai, Ako and Raita were abducted into the spirit world by Radiguet in a desperate attempt to kill them. Hmmm... subtle. But I just have to give credit that this episode foreshadowed one of the Jetmen will die. Episode 30- "The Demon Gods Arise"
Farrah Cat was blindly loyal to Farrah. Fuumin was blindly loyal to her mistress Igam. In fact, she even shielded Igam from death. For some apparent reason, Oyobur remained loyal to Emperor Zeba even until he discovered Zeba's true identity. I just find it very stupid why he chose to take Zeba's orders to die. Zaza in Fiveman was blindly loyal to Dordora. Most of the Zone were blindly loyal to the point that even after discovering Medor's true identity, most of them chose to serve Zone anyway except for Dordora and Zaza. Chevalier fought for Vulgyre to the very end, even until death. Grey was blindly loyal to Maria. In fact, he cared less about winning his bet against Radiguet and Tran. Shizuka herself was blindly loyal to Gekkou. She even risked herself to kill Yaiba. Shitari was blindly loyal to Doukoku. In Maskman we had Takeru vs. Igam. Okay what makes this really disturbing is that while audiences know that Igam is a girl, Takeru thinks Igam is a man! The revelation of Igam's gender crisis really put Takeru into a moral dilemma especially he would never fight against ladies. 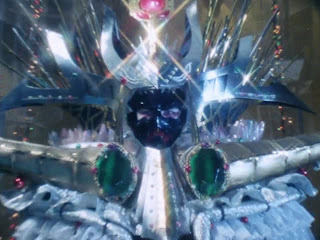 In Dairanger, the fake Gara showed she was no ordinary woman to mess up with. I really thought that her rivalry with Daigo was rooted because of Daigo's love for Kujaku. The fake Gara had no idea she was only a clay puppet created by Shaddam as a replica and not an extension body. I thought Gara really crossed the line here, while Daigo fought honorably. 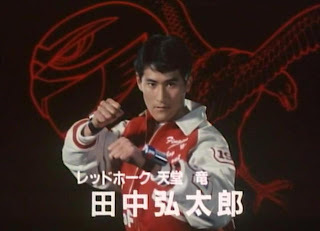 The fake Gara was also rivals with Lin as well.